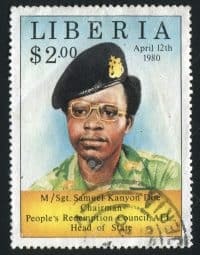 Liberia erupted in violence on April 12, 1980 as Master Sergeant Samuel Kanyon Doe seized power from President William Tolbert, ending 133 years of political dominance by Americo-Liberians. 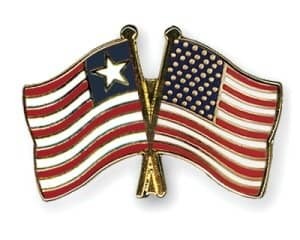 Americo-Liberians traced their ancestry to African Americans and Black British subjects who immigrated to Africa and became the founders of the Republic of Liberia, in power from 1847-1980. In October 1985, having promised to return Liberia to civilian rule, Doe was declared the winner of Liberia’s first multi-party elections. The results were largely rejected by the international community after his own staff took the ballots to a hidden location to be counted. Lacking experience in government, Doe’s rule was characterized by civil unrest and the murder of political opponents. He was murdered in September of 1990 by members of a rival faction. Julius Walker served in Liberia as Deputy Chief of Mission from 1979-1981—long enough to experience the coup and its aftermath. Ambassador Robert P. Smith was in the U.S. for medical treatments when the coup began, leaving Walker to serve as chargé d’affaires. In this interview with Charles Stuart Kennedy in April 1992, Walker recalls how he handled the coup in the hours after it unfolded and his first encounter with Doe himself. Please follow the links to read more about Africa, coups and an American diplomat’s life in the Liberia of the 1950s. 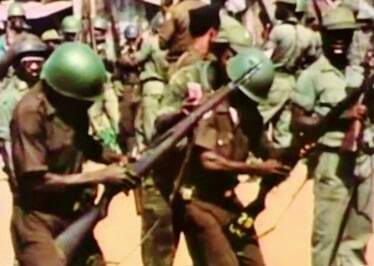 WALKER: The coup in Liberia itself was not a shock to us, but that it came from the NCOs (non-commissioned officers) was. We expected either a palace coup by the True Whig Party or, at most, something which involved the university and the liberals. The night the coup took place was weird. I was Chargé again. We had been to a party Friday night and had been asked to stop by the home of the Guinean Ambassador, the Dean of the Diplomatic Corps, who was leaving over the weekend, a permanent change of station. We stopped at his house, had a few drinks and danced some. We got home around midnight, got into bed and I had just gotten into a really sound sleep when the telephone rang. It was the Agence France Presse fellow. I said, “Well, then you and your wife get on the floor, pull the mattress off the bed and don’t get above window level at all.” They didn’t. For two days they stayed on the floor and crawled everyplace they went because of the heavy shooting. I got in my car and started to town. Monrovia is on a peninsula and its narrowest point is where the Executive Mansion sits. In the Mansion locale, there were only two roads that ran between my house and the chancery building. I took the one the farthest from the Executive Mansion and was sailing along nicely thinking everything was okay. I had a distinctive car, a big red Ford. I rounded a corner en route to the chancery but still a mile from it, and suddenly there were dozens of soldiers in front of me shooting. I threw on the brakes and started to back up. Before I could, a big sergeant came running toward me with his gun at port arms. I stopped. They stopped shooting and he bowed and waved me ahead. The thought went through my mind that he might tell them to start shooting when I got in front of them – but he didn’t. When I got about a block beyond I heard, “begin fire” and they started shooting again. I later learned the house was empty but they thought it was full of armed Americo-Liberians. About 7:00 in the morning the martial music stopped. By the way, that is one of the things I have learned about coups d’etat in Africa. The radios play absolutely the worst military music anyone ever heard and they play it over and over and over. It is almost the worst part of the coup. Well, the music stopped and they announced the government was in the hands of Samuel K. Doe, a Master Sergeant. We were stunned. No one ever heard of him. We were busy sending information in, doing short telegram and sitreps, bringing the Op Center up to date when about 10:00 the music stopped and the announcement was made that Samuel Doe wanted to see the American Ambassador and the Russian Ambassador. No sooner was the announcement made than my phone rang. It was my Soviet colleague who asked if I was going. I went down to see him and asked what I could do for him. None of our local staff had come in that morning for obvious reasons so there was no one to drive the official car. I didn’t want to drive through the shooting and then be faced with the interview on arrival, so I found a junior political officer who said he would be delighted to drive. He brought the car around. He was so nervous that he scraped the side of the car on a wall. Nevertheless, we drove down with Matthews in the car with me and a sergeant in a taxi in front of us. The Sergeant stuck a rifle out the window as a sign to anyone in the area not to shoot. We went down the road without problems; obviously there was no traffic. We got to the Executive Mansion and found it had been shot up during the night and the automatic sprinkler system had come on, drenching the building. I met with Doe in a large gazebo. He and his committee were there to meet me. It was warm, hot. Liberia is hot and steamy. This building was full of the odor of perspiration and fear. I don’t know how to tell you what fear smells like, but once you smell it you know what it is. It is overpowering. Doe and his group sat on one side of the large room. A chair in the center of the room was indicated as the place for me to sit. I sat and Doe started to talk then seemed to decide we weren’t close enough. He began hiking his chair closer as he sat in it. He would hold the chair, jump a bit and move forward. I began hiking mine towards him. And for a while we looked like a couple of turtles bouncing along the floor until we were almost face to face – only two feet apart. I probably was involved in one of the most threatening situations the day after the coup – Sunday morning. I was driving to the office and was stopped by a soldier wildly pointing a rifle at me who forced me off the road. He was vibrating, shaking so badly he could barely speak English. He saw my briefcase and wanted to know what was in it. That really surprised me because Liberians normally didn’t use that title. But this guy not only knew who I was but knew the function I had at that moment. He was in a taxi with some other soldiers. They jumped out and came running over with rifles at port arms to learn what was going on. They immediately accused the soldier of insulting me and insulting the United States. They grabbed him and took him off to Sergeant Doe insisting I go with them. It was a good thing that I went. I told Doe that I understood that the fellow might have been drunk or something else and not to be too hard on him. « Iran-Contra: Who Knew What When?